The fishing on Silver Lake and Rush Creek has picked up this past week thanks to a good load of DFW fish stocked on Tuesday and another load of Desert Springs, Oregon larger Rainbows going into Silver Lake on Friday. 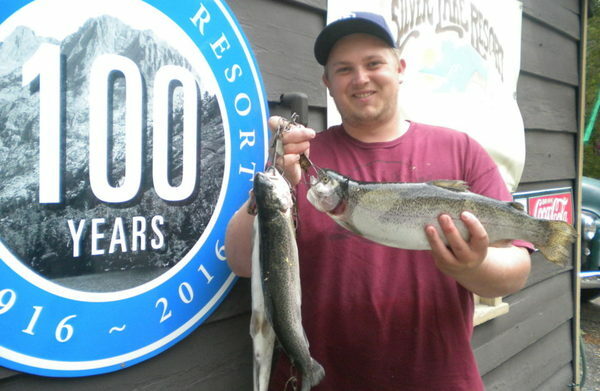 The load from Desert Springs purchased by Silver Lake Resort for your catching pleasure was 400 pounds with an average of 2 pounds apiece. Water levels are looking incredible for the middle of August even with Alger Creek slowing down. Silver Lake is at the exact same water level as it was in April and Grant Lake continues to increase in level on a daily basis which is always a plus for this time of year. It sure is nice to see Grant Lake back to some of the higher levels of years ago!!! 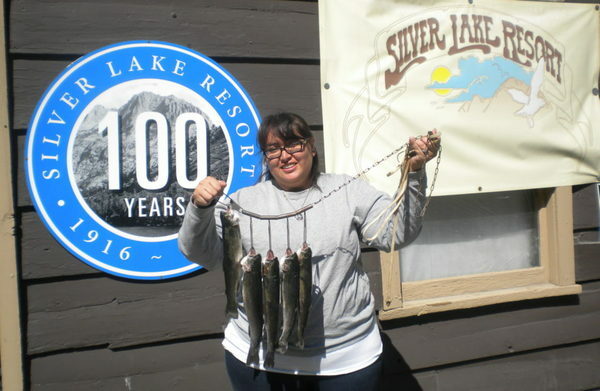 The fishing on Silver Lake has been better this week than last and we have seen a lot of stringers and nice size fish weighing in at over two pounds. Bait Fishermen have seen some good results using Berkley Power Baits in all Bright Colors – Rainbow Glitter Garlic, Chartreuse, Florescent Orange, to name a few. Berkley Mice Tails continue to be steady as well. Troller’s are working deep in the waters pulling flashers with a worm or Tasmanian Devils during the day and seeing good results early and late in the day pulling streamers like an Olive Matuka or Green Wooly Bugger. Look for the fishing to continue to improve as we start to get more cooler nights. DFW is on schedule to stock both Silver Lake and Rush Creek this coming week. Labor Day weekend is just around the corner, which means we will be gearing up for our annual Chris Jones Memorial Scholarship BBQ and Horseshoe Tournament to be held Saturday, September 3rd with tons of Basket Raffles and good food and we will be continuing to have live music as scheduled with the ever Famous Tom Gault and “Good Livin” playing in the RV park on Saturday August 27th!!! Jeffery James played this past week and was a huge success and everyone enjoyed good music and good old S’mores!!! 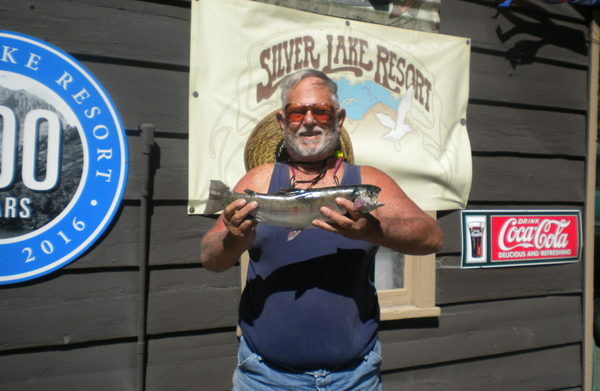 Summer is starting to wind down as schools start earlier and earlier so don’t miss your chance to come on over to Silver Lake Resort for some good fishing and great breakfast and lunch in the Silver Lake Café. Happy Fishing and We Will See You at The Lake!!! Chris Saundrs of Victorville caught this nice 3 pound 3 ounce Rainbos fishing down on Rush Creek using Salmon Eggs. The water levels on Silver and Rush are looking good, as well as the water down on Grant Lake that continues to increase daily despite what some rumors are saying. Great fish out of Rush Creek Chris. Well Done!! Does it seems odd to anyone else that the Semi-Famous “Big Fish” Bob hasn’t been in the fishing report lately?? Maybe we need to consider changing his name… Just a Thought!! !